We're still in discovery mode with our new idea. This means we focus a lot on validating the concept to make sure we're developing the right thing. 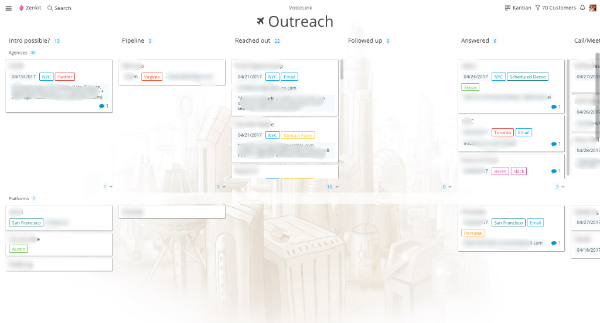 This means, while Alex is working on several testable prototypes, that I'm spending most of my time on outreach: emailing agencies, independent voice developers, and startups to find out main pain points in their processes. Zenkit, a startup from Karlsruhe, Germany (full disclosure: I know them) markets itself as a more flexible Trello alternative. When you're reaching out to dozens of people and try to schedule meetings with them, it's quite some back and forth, until a date is set that suits everyone. This is where Mixmax works really great. It's a Gmail-plugin that helps you easily access stuff like email templates and calendar features. 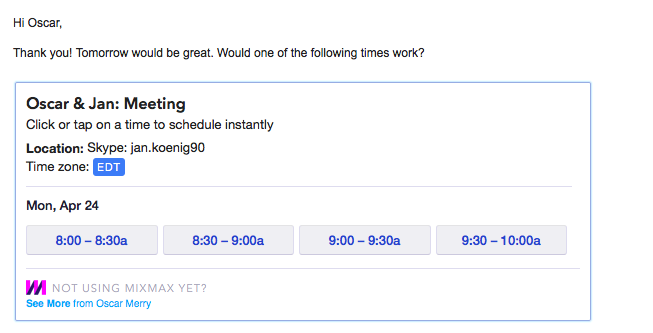 With a few simple clicks, you can suggest slots for a meeting. The other person just accepts, and calendar invites are sent out automatically. Genius! Already saved me a lot of time. What tools are you using to reach out to people?